Aquarium of the Bay is located at Pier 39 near the intersection of Beach Street and Embarcadero. The 65,000-square-foot facility exhibits over 20,000 marine animals that are indigenous to San Francisco Bay and the nearby waterways. Animals on display include various species of sharks, sturgeons, octopus, rays and rockfish. Over 600,000 people visit the aquatic nature center each year. The Under the Bay Exhibit reveals the mesmerizing world of the ecosystem that surrounds San Francisco. 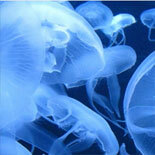 Guests will enter the ethereal world of the jellyfish that inject and immobilize their prey with venom. The undersea walk is a popular attraction, which features an acrylic tunnel surrounded by various types of sharks prowling the water in search of prey. Over 1,000 aquatic animals are on display in the Discover the Bay exhibit’s eight tanks. Visitors can view Bay Pipefish, moray eels and Garibaldi, the official marine fish of the Golden State. The interactive Touch the Bay exhibit enables visitors to create indelible memories with bat rays, leopard sharks, starfish, sea cucumbers and other marine animals. The San Francisco Bay Estuaries Exhibit explores the marshes, mudflats and other wetlands that comprise a portion of the watershed that drains into the bay. Visitors can touch fossils and skeletal remains of a shark’s jaw. The center hosts special events, such as weddings, birthday parties, sleepovers and corporate gatherings.